Twenty one miles long and a smile wide is how Bajan’s refer to their beautiful Caribbean Island known as Barbados. The island nation is the most eastern in the Caribbean. She is 166 square miles and one of the most densely populated in the western hemisphere. It is clear why so many would want to call Barbados home; a tropical paradise with crystal clear water, white sandy beaches, palm trees swaying in the breeze, Barbados is the postcard of the exotic, relaxing, romantic, enchanting beach experience. The name Barbados comes from the Portuguese, while en route to Brazil. The Island was covered with fig trees that had a beard like appearance from their hanging roots. The words Los Barbados means “Bearded ones”. Recent archaeological discoveries point to the belief that her earliest inhabitants were the Arawaks who arrived on the island from Venezuela. There is evidence that points to settlement sometime around 1623 B.C. In 1200, the Arawaks were overtaken by the Caribs. The first English ship landed on the Island in 1625 and she was claimed for England on behalf of King James I. Barbados remained a British colony until 1966, when she gained full independence. As with many of the Caribbean islands, the land was deforested to make way for cotton and tobacco plantations, however it was sugar cane that made many plantation owners their fortunes. The Barbadians dominated the sugar industry in the early years and with it a large market for slavery. Many of the slaves were brought to the island by the Dutch on ships from West Africa. It was also a place for the English to send their criminals. In fact, in England when the sentence was handed down, it was known as being “Barbadoed”. Thankfully slavery was abolished and freedom was celebrated in 1838 when over 70,000 African descendents took to the streets in celebration. Today sugar cane is still an important industry on the island but has been taken over by tourism, financial services, fishing and rum. One of the most celebrated occasions on the island is the “Crop Over Festival” which marks the sugar cane harvest and the importance of it to the Island’s history. This is a wonderful celebration (much like the “Junkanoo” festival in the Bahamas) with colorful costumes, the beat of the Islands Calypso musicians and of course, their sumptuous local cuisine. Barbados’s population is 90 percent black and four percent white, with a mix of Asians and others making up the balance. English is the official language however the fusion of English and the many West African languages, has made for a colorful local dialect. Bajans are known to be quick witted, fun loving and very friendly. If you were to be invited to a Bajan’s home for dinner, they would likely separate you and your spouse to encourage greater conversation. Just as with the language, arts and music, the cuisine is a tantalizing blend of old and new; the main influences coming from Africa, the Caribbean, West India and England. They like it spicy, using lots of scotch bonnet peppers and onions. The national dish is Flying fish served with Cou-Cou. 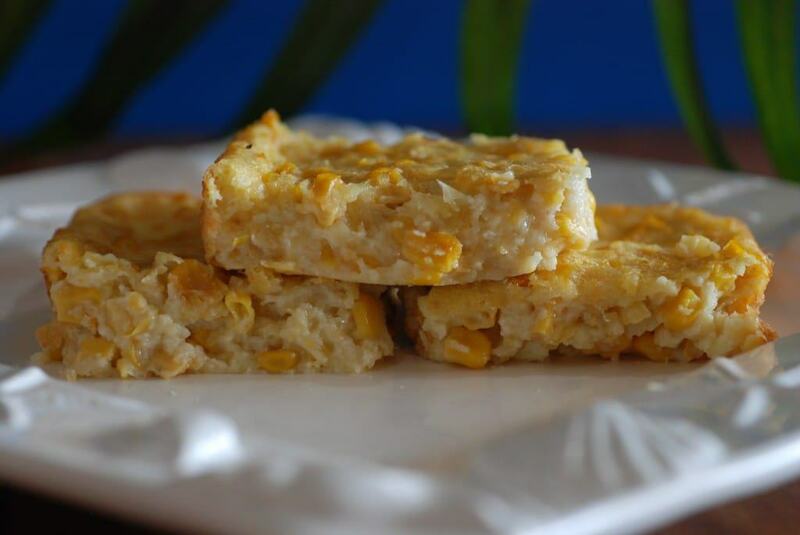 Barbados is sometimes referred to the “land of flying fish” and Cou-cou is a porridge consisting of cornmeal and okra. Being an island nation, fish is a mainstay in the Bajan diet. Aside from seafood, they also love their locally farmed pork and chicken. As I searched for recipes to represent Barbados for our International Cuisine meal, I kept coming across a seasoning simply called Bajan seasoning. 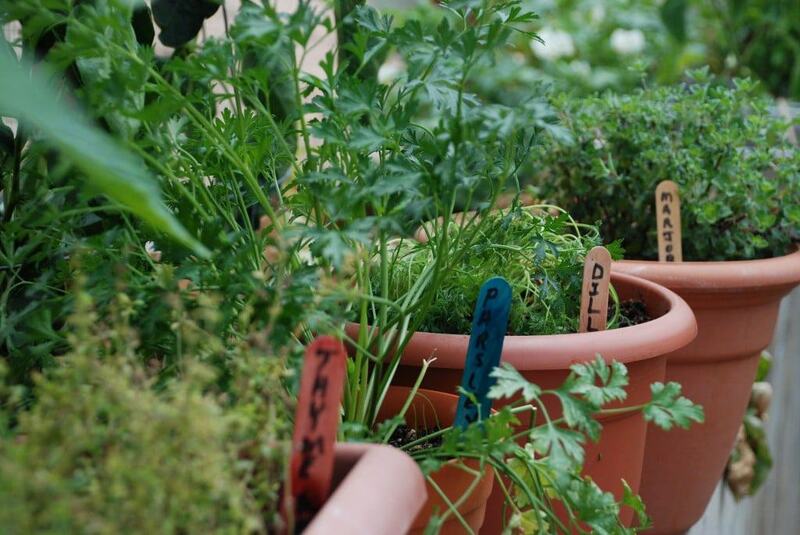 Although I found numerous variations, they all had a common thread; fresh herbs, onions, garlic, scotch bonnet peppers, lime and vinegar. I will use it in a few of the recipes for our meal. 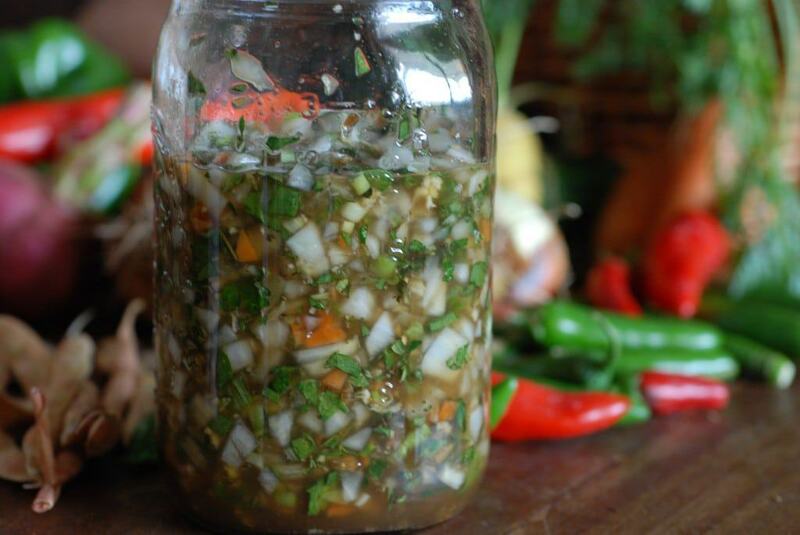 I was able to make this seasoning with items fresh from the garden! We put on Calypso music with an infectious African beat, to set the mood. 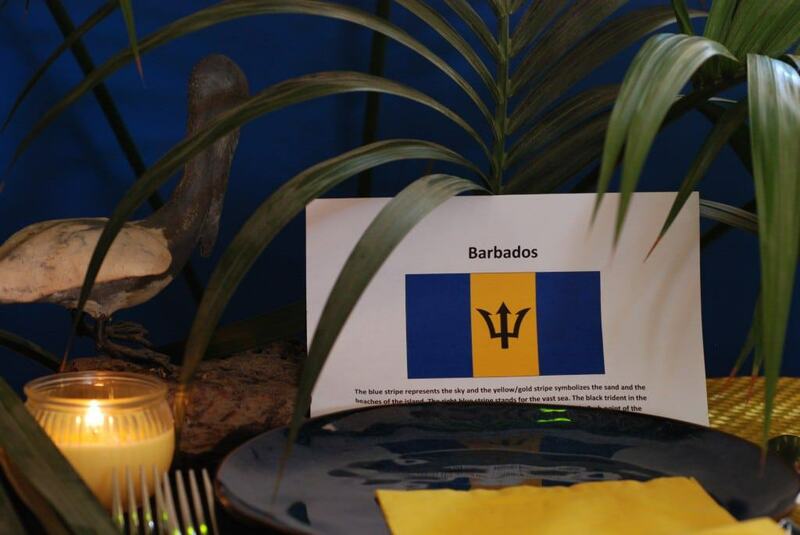 We decorated the table in the color of the Barbados flag; blue, yellow and black. We lit candles scented with a tropical aroma. The centerpiece was made with palm leaves shrouding a pelican statue (the pelican is the national bird of Barbados.) We began our meal Continental style, with the knife in the right hand and fork in the left. We started with the most scrumptious fish cakes I have ever had. They were not what you would expect of a fish cake; they were light, fluffy and deliciously flavored with the Bajan seasoning. The Marie Rose sauce was the perfect dip for the fish cakes. It was reminiscent of a thousand island type dressing, but with a kick. 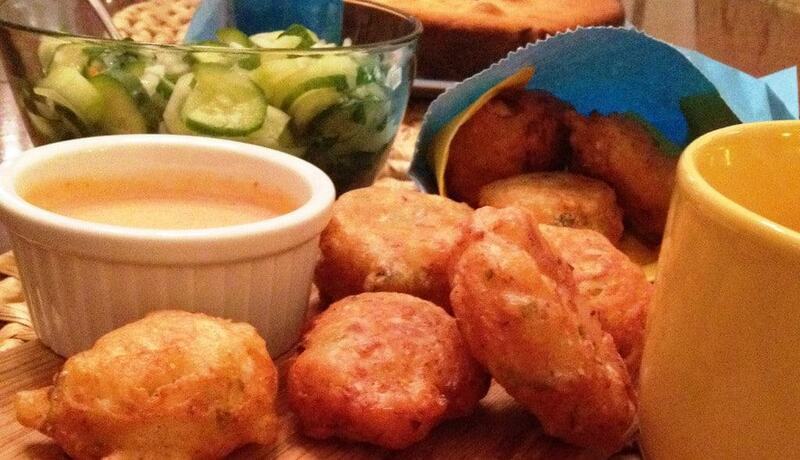 These fish cakes are found all over the island, from the five star hotels to the local rum shops, and now I know why! 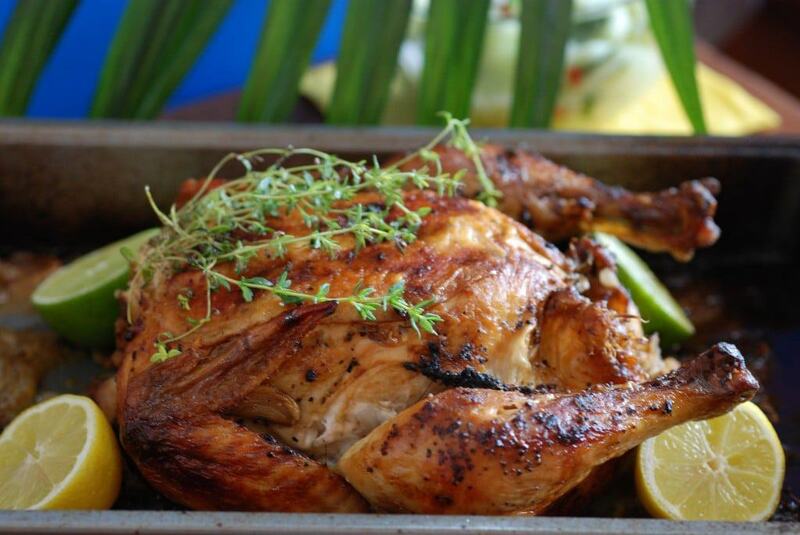 The Bajan baked chicken dish was also flavored with the Bajan seasoning and is a common dish enjoyed by the locals on a typical Sunday afternoon. 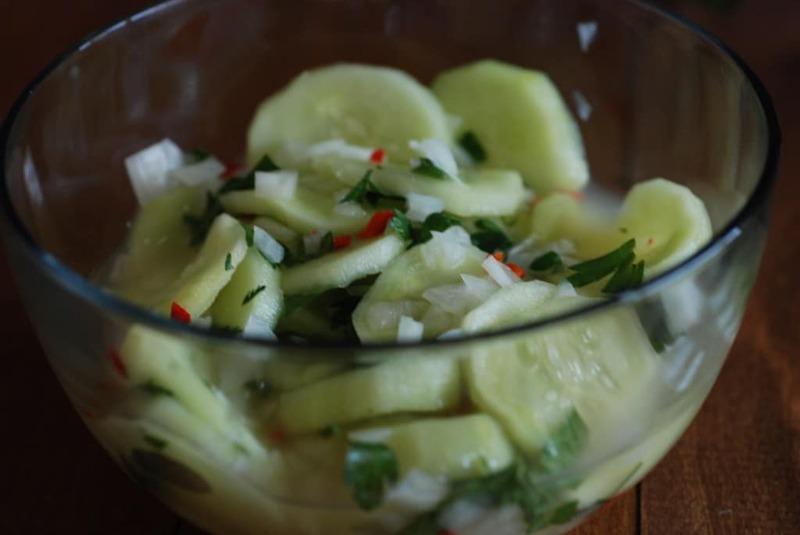 The side dishes of pickled cucumbers and corn pie are staples in the Barbadian cuisine and the perfect accompaniment to the delicious baked chicken. 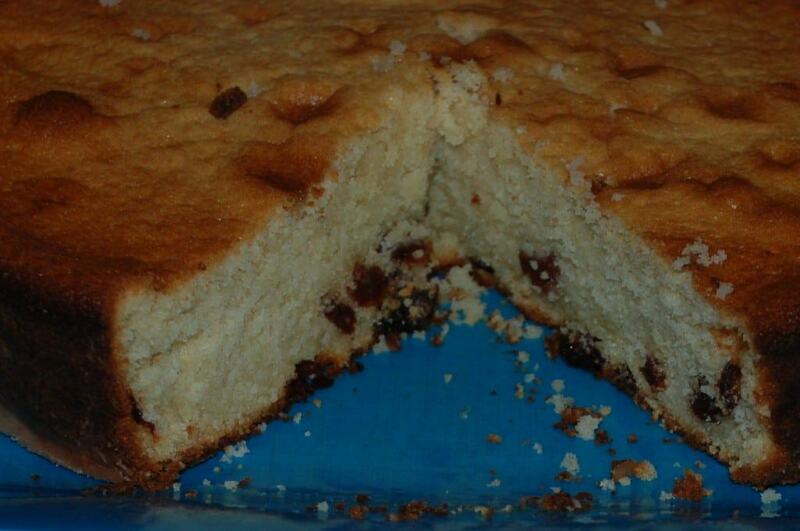 For dessert, the plain cake with a few dried cherries in the mix, called pudding, was a recipe that came from a Bajan grandma in the early 1900’s. It was yummy!